Interpreting the Bible can be difficult, especially when personal biases, opinions, and conflicting views are involved. For centuries, the Bible was interpreted as a book full of allegories and metaphors. The Scriptures were viewed as figurative language for the most part. In more modern times, literalism was the predominant view. This pendular swing of extremes still prevails. Spiritual discernment—given by God's Spirit—is needed for understanding what is meant to be figurative and what needs to be understood in a more literal sense. Above all, it's important to remember the Bible is God's revelation given to all humanity. Because it's from God to us, the Bible needs to become personal for us. Not our own personal interpretation but as a personal message from God to us. You have come to Jesus, who brings the new promise from God, and to the sprinkled blood that speaks a better message than Abel’s. Where are we told that we've come to? How is this place described? Who is gathered at this mountain? How many people or peoples are mentioned? Who is spoken of by name and what two things are included with Him? What is the strong warning given here? How is its serious nature reinforced? This heavenly mountain—Mount Zion—is in stark contrast with the dark, foreboding mountain of Mount Sinai where Moses received the Law. Mount Zion represents not only heaven, the dwelling place of God, but a new relationship with God through Jesus. This is the fifth and final warning given in the book of Hebrews. It is far more personal than the previous four warnings. Simply put—rejecting the New Covenant of grace is a rejection of Jesus, God's Son. The Old Covenant was a Law that required obedience, an obedience the nation of Israel couldn't and didn't keep. The New Covenant is more personal. It is relational. It provides the opportunity for a new relationship between God and humanity. Jesus came to provide the means of reconciliation and restoration of relationship with God for all humanity. A relationship of trust—faith—based upon God's kindness and favor—grace—gained through the Lord's death on the cross and His resurrection from the dead. If this description of Mount Zion—the heavenly Jerusalem—is figurative, why is it spoken of as actual and present? Why do you think it's necessary to have this detailed description of Mount Zion? What stands out to you about this fifth and final warning? 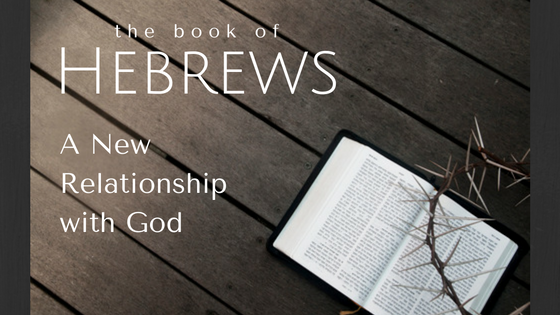 Do you understand how personal and relational the New Covenant of grace is? The value and purpose of fear is usually misunderstood. The absence of fear is often touted as a good thing, as a sign of bravery or courage. But those acknowledged for their bravery and courage speak of moving beyond their fear. It wasn't absent, it was overcome. There are two broad categories of fear—a fear of respect and an anxious fear. An anxious fear produces worry and muddled thinking. A fear of respect heightens awareness, brings alertness and clarity to our thinking. Anxious fear paralyzes a person whereas a respectful fear tends to motivate. The flight or fight response illustrates this distinction in fear. When it comes to God, people tend to mix the two together as if it's all the same. This brings confusion and misunderstanding. When both types of fear are dismissed, it's as if God doesn't exist. Both responses are unwise. You have not come to something that you can feel, to a blazing fire, to darkness, to gloom, to a storm, to a trumpet’s blast, and to a voice. When your ancestors heard that voice, they begged not to hear it say another word. What are the images of the scene described here? What is this leading up to? Who is spoken to and what are they told? Do you understand why? What is Moses' response to all of this and why? How would this apply to believers then and now? The fear of God is often misunderstood. It is typically viewed in one extreme or another. Either abject anxious fear or a humble respect. This scene and several other places in the Bible describe the fear of God as an overwhelming awe. A realization of who God is which made Moses tremble, yet also drew him up the mountain to meet with God. It is at once, a sense of how personal and powerful God truly is. This reminder of the scene before Moses received the Law on tablets of stone reinforces how different the Old and New Covenants are (Heb 8:8-9). It is a solemn warning of how important and necessary it is to hold firmly to the truth of the New Covenant (Heb 8:10-12) of grace through our relationship with Jesus as both Lord and Savior. Are you familiar with this story? If not, it's found in Exodus Chap 19. How does this relate to all that's been written in the book of Hebrews up to this point? How is it related to what's been Jesus and His atoning (redemptive) death upon the cross? Have you experienced the difference between paralyzing and motivating fears, and the fear of God? The social and political world we live in doesn't tend to promote peace or godliness. It grieves me to see the contentious banter expressed in social media and in network news media. I'm really grieved by the vitriolic exchanges between Christian believers who have differing opinions. None of that honors God and it certainly doesn't make being a Christian attractive to non-believers. It does take effort to live at peace with others and to live a life that honors God. But the secret isn't more discipline and self-effort, although self-control is an attractive and valuable virtue. The transforming power of God's grace or kindness is the key. God's grace at work in our hearts keeps things like bitterness, envy, and greed from corrupting us. A holy life is one that chooses God as the ruler of our life rather than emotions or circumstances. Make sure that no one commits sexual sin or is as concerned about earthly things as Esau was. He sold his rights as the firstborn son for a single meal. What two things are we to try and do? How do you think this is possible? What is needed to prevent bitterness from taking root and growing in our lives? How does the example of Esau's remorse illustrate what two things we are to avoid? Is there a difference between remorse like that of Esau and true repentance? Relationships are always important. Our priority is to have a genuine relationship with God through faith [trust] in His Son. And Jesus made it clear that our relationships with others are a vital priority in our relationship with Him. This is why we are to live at peace with one another, to be gracious and not bitter with one another. Nor are we to be greedy or selfish because these attitudes damage our relationships. A holy life is one dedicated to the Lord and His purpose for our life. It's not about being good but allowing God's grace and goodness to transform our hearts. This is how God brings change in our life that others see. Repentance is not the same as remorse. A remorseful person feels sorry for themselves and the consequences of their actions. Repentance requires a change of heart and turning to God to seek out His grace and goodness and restoration. How are the first two exhortations related to the issue of bitterness taking root and growing in our heart? What is needed to keep bitterness from growing in our hearts towards God and others? What do you find most difficult in dealing with bitterness in your heart? Are living at peace with others and living a godly life personal priorities for you? Perseverance in undervalued. It's a virtue that gets ignored. It's not glamorous and may seem boring to some. Perseverance is underrated but it shouldn't be. It's a valuable virtue. Perhaps it's viewed as underachieving or being stuck in a rut. But that would be inaccurate. Perseverance is all about strength and endurance. Persistence is often valued and seen in a better light. It's a sought after quality in business and sales. And yet, persistence and perseverance have synonymous definitions. Both words speak of continuing on in the face of adversity. Persistence and perseverance are highly valued in athletics and science, as they should be. When it comes to faith, God highly values perseverance and so ought we. Strengthen your tired arms and weak knees. Keep walking along straight paths. What are we told about discipline and fathers? What is your experience with this as a child? How is God's discipline described? What is His intended purpose for discipling us? What is the universal response to discipline? Yet, what is the intended fruit of God's discipline? How is the final exhortation in this text expressed? Does this make sense to you? Over the past few generations, various stances have been taken on disciplining children. Typically, it vacillates between permissiveness and strictness. This seems to reflect what is seen regarding spiritual discipline in the church. It can be seen in what's tolerated culturally but more importantly, it reveals how we value and view personal discipline in our lives. None of us would choose correction or discipline for the most part. Thankfully, God is both merciful and gracious. If we don't pursue spiritual discipline for ourselves, He provides the means for us to receive it, as in a previous devotional. When we embrace God's discipline applied in our lives it benefits us. Then we mature and grow spiritually. When we resist it, then we get stuck in a rut and underachieve. When we persevere during trials and tests in life and keep walking in straight paths, it will bear peaceable fruit in our lives. How have you seen God bring correction and discipline in your life? When have you experienced the benefit of perseverance in your walk of faith? In what ways do you both pursue spiritual discipline in your life now? Where have you seen the direct result (fruit) of God's discipline in your life? Children need boundaries. We all do. Without clear boundaries of what's okay or not okay, we run amuck and trample on the feelings and rights of others. Clear boundaries and consistency are essential elements for raising healthy and confident children who will mature into healthy and confident adults. We've seen this with our own children and hundreds of others my wife and I cared for over the years. Now we see this with our grandchildren and children of our extended family in the Philippines. Sadly, a lack of healthy consistent discipline has rippled through our nation, beginning with the "me generation" of the seventies to a couple million people incarcerated and well over four million others on probation or parole, producing heartache and despair. No boundaries and the abandonment of discipline brings conflict and disruption in families and society at large. We all need discipline and boundaries. Without them, we will self-destruct personally and so will our nation if things don't change. Endure your discipline. God corrects you as a father corrects his children. All children are disciplined by their fathers. What is said about our struggle with sin? How does this relate to you in a personal way? What are the encouraging words spoken about here? How is this strong exhortation encouraging? How is the idea of God's discipline explained? Does this make sense to you? How is the discipline God gives His children different than what our natural parents do? No one likes correction, not immediately. Neither do we like to undergo discipline or accept punishment, even when it's deserved. We can be quick to claim, "It's unfair!" But much of the time we need to be disciplined for our own good. This is one of the more difficult things for believers and nonbelievers to understand. "Why would a loving God discipline, correct, or punish anyone?" The short answer is—so we don't become spoiled brats! Also, God wants to develop a nature in us like His. He wants us to fit in with His family, that is, He wants us to be His legitimate children, not to be illegitimate, self-willed rebels. An important element of God's redemptive work is restoring us so we may enjoy a face to face relationship with God. But this requires an internal work in us. A transforming work in our hearts and lives. God uses external situations in our life to shape and transform our inner nature. How did this exhortation speak to the believers who heard this first and how does it fit for us? What kind of discipline did you receive as a child and how has it shaped your life? Do you think your own upbringing might get in the way of understanding God's discipline? How can you better understand and accept God's discipline in your life?